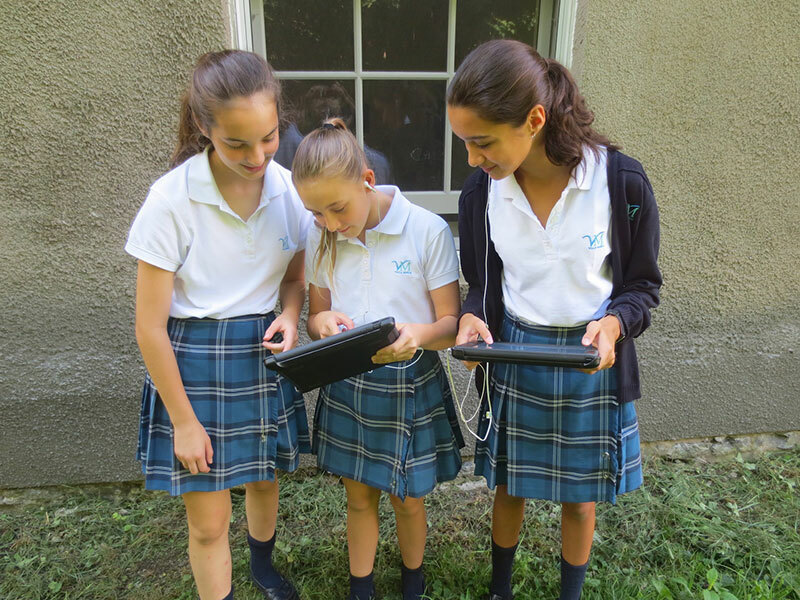 Like many high schools across the province, Villa Maria High School in Montreal has recently introduced an iPad program to promote the use of technology and responsible digital citizenship. Teachers are therefore integrating various iPad applications into their teaching. This raises some interesting questions for art teachers: How can these devices be used in the art room? How can iPads enhance teaching and learning? What kinds of creative projects are possible with iPads? 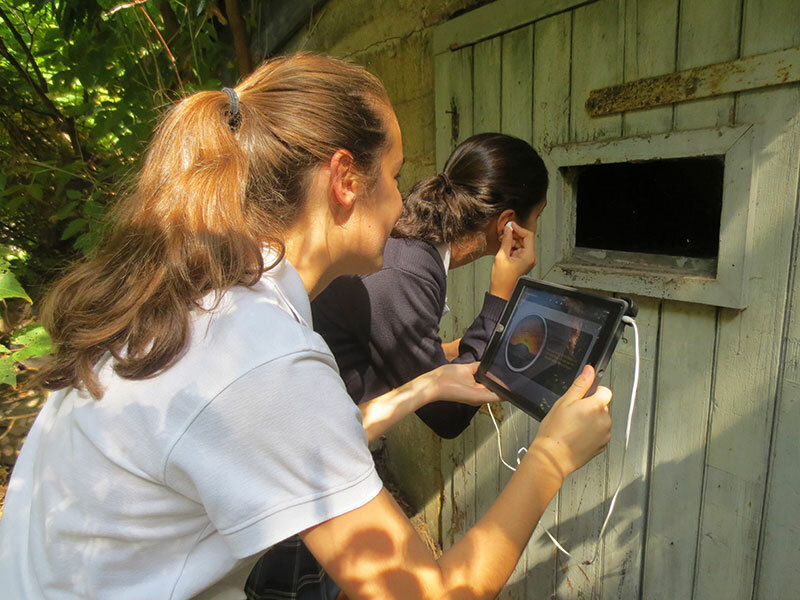 To address these questions, we developed an art project that utilizes Garage Band, a free, user-friendly sound recording and editing program available on Mac and iOS devices, to introduce students to notions such as soundwalks, soundscapes and sound art installations. In the same vein as the work of Yves Amyot (2010) and his techno-walker or the self-guided sound walks presented by Scott Macleod (2015) in the latest issue of Vision, we propose a pedagogical approach with a particular emphasis on the sound medium and the act of walking. 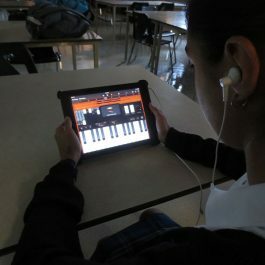 The iPad and Garage Band are by no means essential; a large variety of similar recording programs can be used on any other platform. 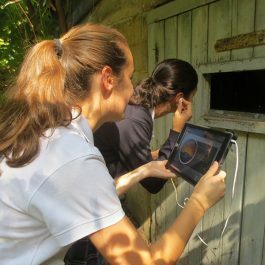 For this project, we asked students to go on a listening walk to observe the aural environment of their school, to record and edit sounds on their iPads, and to present their sound collages to the class. This article aims to help teachers apply this lesson in their classroom. We discuss some inspiring artistic examples, address important technical issues, and provide a detailed lesson plan as an introduction to the creative possibilities that sound art has to offer. We also provide links and resources, and we suggest ways art teachers can expand on this project. We encourage teachers to implement this project in order to create a bridge between technology and artmaking. Two contemporary artists who use sound as a key element in their practice have been our main sources of inspiration. Canadian artist Janet Cardiff works primarily with sound and sound installation. Cardiff creates audiowalks that guide her audience with her voice whispering through headphones as they walk through a select area. These works use sound to merge a virtual and imaginary world with a physical space (Schaub & Cardiff, 2005). In Cardiff’s the Forty Part Motet (2001), the voices of individual choir members are recorded separately and played back through a series of speakers arranged in a circle. The spectator can walk around and experience the voices of individual singers and stand in the center and listen to the choir as a whole. This sound installation emphasizes the interconnection between sound and space, as well as our embodied and subjective relationship to sound. Andra McCartney (2010), a soundwalk artist and professor at Concordia University in Montreal, explores soundwalks as immersive experiences that involve the subjectivity of walker and listener. Both of these artists use non-visual sensations to create engaging experiences. Our aim for this project is to entice students to become aware of their relationship to their immediate environment by exploring their world with their ears. By doing this, we also hope they learn how to incorporate non-visual elements in their art. Art Problem: How Can We Make a Soundscape? Students begin the process by going on a listening soundwalk to observe sounds in their school. Then they do a recording soundwalk to capture sounds that represent their school. They then combine and edit these recordings to create a soundscape composition that they present to the class. To listen, record and edit sounds to create a one-minute soundscape composition. To present this soundscape composition to the class. 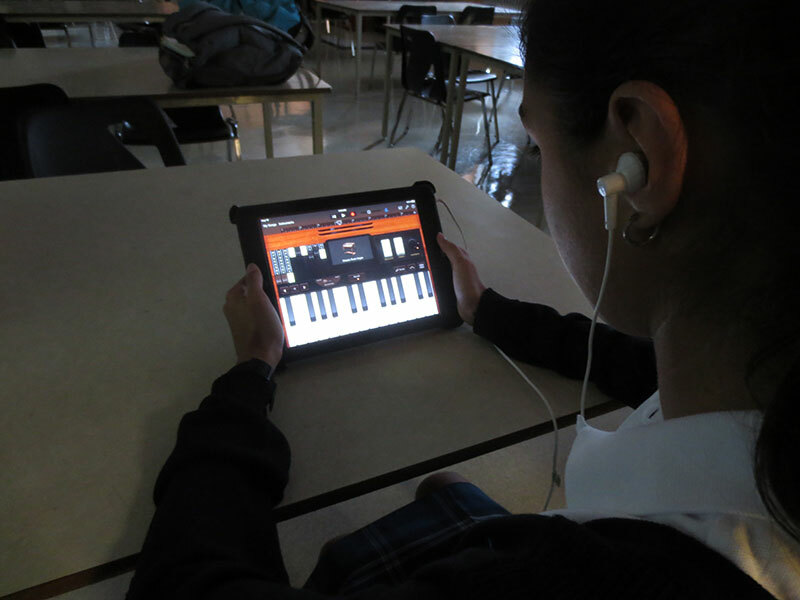 Material: iPad with Garageband, Headphones. An effective way of introducing soundwalks is to go on a walk and to actively listen to sounds. Introduce the students to the works of sound artists such as the ones mentioned above. Prompt students with a simple question: “What are the sounds in your school?” Have students create a list of sounds on paper. Ask students to expand on this list by going on a listening soundwalk. Send students out in small groups to explore their school with their ear, and write down what they hear with pen and paper. This list will become the basis for the next step. During this lesson, students work in groups to collect and record sounds that represent their school. Begin with a basic introduction to recording with GarageBand. Cover how to create a new project, turn off the metronome, record, and move the playhead to the end of the track you just recorded. (This last point is important if you want to avoid recording over previous tracks). 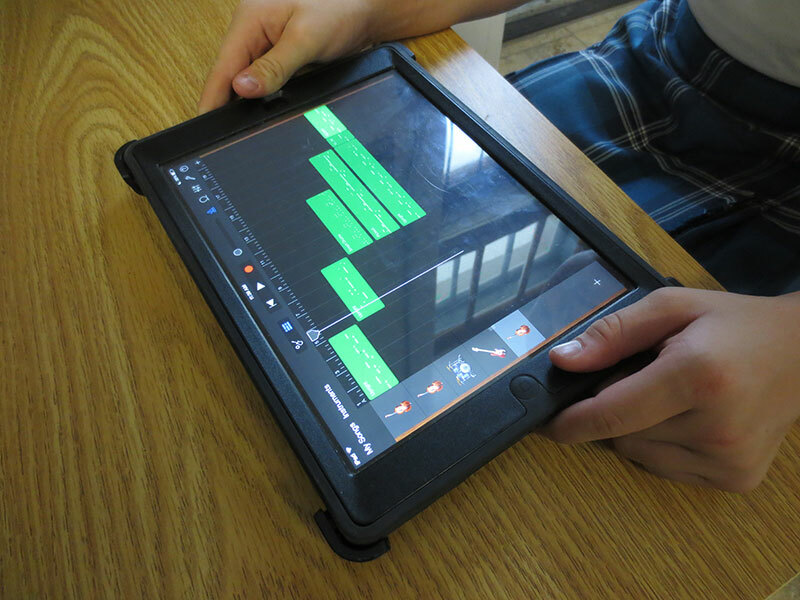 Once the basics of recording with GarageBand are covered, students take out their lists from the previous lesson, discuss the sounds they want to record for their composition, and go on excursions to record. These recordings will be used for the next session. This is the main technical step. Demonstrate the use of some basic editing tools, such as: cutting, trimming, looping, layering, and adding effects such as reverberation. Use the notion of collage as an analogy to the idea of creating a sound environment. Students can cut, trim, loop, and layer sounds in a similar manner to turn the ordinary sounds of their school into a work of sound art. In the final lesson, students present their soundscapes to their classmates. While listening to each composition, students identify the sounds they hear. After listening, students can discuss the similarities and difference in how various groups chose to represent their school’s soundscape. At this stage, you can also introduce students to installation art and other ways of expanding on their project. There are endless creative possibilities for art teachers to expand on the soundscape project. One possibility is to use soundscapes to introduce art students to the contemporary practice of installation art. Installation artworks are immersive environments that transform space. As mentioned in Cardiff’s Forty Piece Motet, the sculptural arrangement of the speakers defines the space, and the spectator moves through space to experience the artwork. In the art classroom, this relationship between sound and space could be explored in immersive installations that start as soundscape compositions and become projects that incorporate paintings, photographs, dance, movement and performance. Another option is to incorporate sound and video by using the soundscape composition as the soundtrack for a video art project where students add visuals to the sound. Alternatively, the teacher can provide a silent video and ask students to create a soundscape that compliments the video. 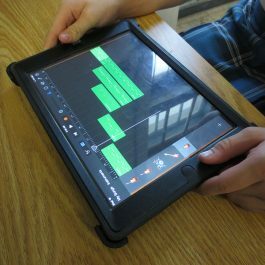 When we conducted these lessons with high school art students, we were pleased to observe the students’ excitement about learning to edit sounds with Garage Band. Their soundscape compositions showed a rich variety of approaches to the representation of the environment of their school. The project proved an excellent vehicle for promoting creative expression and collaboration, and for introducing students to sound art and installation art. Above all, this project enabled us to use mobile devices, which are ubiquitous in our modern lives, in the service of multi-sensory art making.